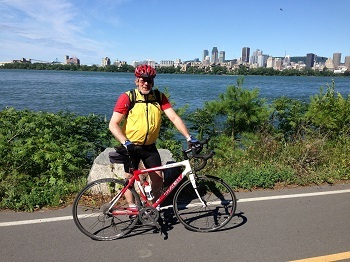 A Montreal-based pharmaceutical research director, John Parkinson, has embarked on a 2,500-kilometer cycling challenge to raise money for mothers and children in Ethiopia. He will be donating the money to Christian Children's Fund of Canada (CCFC). Every minute at least one woman dies from pregnancy or childbirth complications leaving 1 million children motherless. With your help, we can improve the odds of survival. A Montreal-based pharmaceutical research director, John Parkinson, has embarked on a 2,500-kilometer cycling challenge to raise money for mothers and children in Ethiopia. He will be donating the money to Christian Children's Fund of Canada (CCFC) for the organization’s IMPACT (“Improving Maternal and Child Health: Partnership and Action for Community Transformation”) project in Ethiopia. Parkinson, who moved from the USA to Canada in 2010, started his Miles for Smiles challenge in April 2013 and hopes to complete it by October. Since then he has raised $2,025. Together with his wife, Jolie, they matched the first $1000 of donations received. 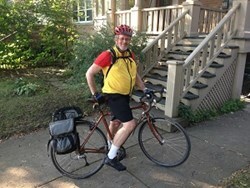 “My goal is to complete 2,500 kilometers and raise at least $5000, simply by commuting to and from work and cycling for fun on weekends,” he said. Parkinson was looking for a charity to work with on specific projects that would be meaningful to him and his wife. He chose the CCFC for its ability to assist children in need around the world. “For many years now, my wife, Jolie and I have been sponsoring children through Christian Children’s Fund of Canada and its U.S. affiliate, ChildFund International. We got to know the wonderful work of these organizations and we’ve seen the positive outcomes in the lives of children and their families in these struggling areas,” Parkinson said. The IMPACT project benefits more than 120,000 mothers and newborns in Ethiopia. It was initiated by CCFC to improve the basic health needs of mothers and infants in the country and decrease mother and child mortality rates. The three-year program is funded in partnership with Foreign Affairs, Trade and Development Canada (formerly the Canadian International Development Agency - CIDA) and donors of Christian Children’s Fund of Canada. “It was pretty easy to align with the IMPACT project since my career has been in the health care industry. The triple matching funds from the Canadian government, which mean a donation has four times the impact in the end, is a huge additional motivator,” said Parkinson. Parkinson is appealing for help from Canadians to reach his fundraising goal. “Every minute, around the world, at least one woman dies from complications related to pregnancy or childbirth, and about one million children are left motherless. These children are 10 times more likely to die within two years of their mothers' death. With your help, we can improve the odds of survival,” Parkinson said. CCFC’s Director of Fund Development, Emily Dawson, is grateful to Parkinson for his campaign. “We are exuberant in our gratitude to John Parkinson. His continued support is a remarkable contribution to our fundraising efforts as we strive to make more dreams become reality for mothers and infants,” she said. To learn more about John Parkinson’s cycling challenge, visit his webpage at: or call Emily Dawson at 1-800-263-5437 ext. 525, Monday to Friday, 8:00am to 4:00pm.